The KIA stand at the 2007 Frankfurt auto show wasn't the easiest place to find, but it hosted two important debuts. The car was the Kee, a bright yellow two-door coupe concept. The man was Peter Schreyer, the Kee's designer, former VW Group design hero and Kia's new design czar. Poached to become Kia's global design chief in 2006, the urbane shaper's resume includes the slick Audi TT and first-generation A6. Now Schreyer's Kee concept has become road-going reality in the form of the Cerato. The look of his Cerato's exterior is clean, modern and nicely detailed. It stands up well against any Euro or Japanese opposition and simply banishes most Korean efforts (including the old Cerato) as jokes from times gone by. Perhaps more surprising — actually, definitely more surprising — is the drive experience. 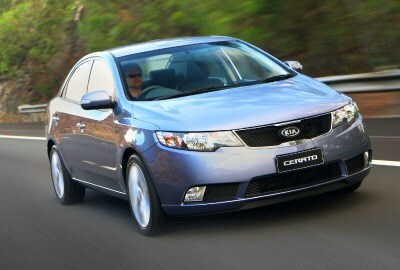 An extensive launch drive left no doubt: the Cerato has dynamic capabilities well beyond the Korean norm. Riding on a significantly longer and wider footprint, the new Cerato combines the Hyundai i30 strut front-end with a new torsion-beam rear. The result is convincingly tidy handling and a controlled ride. Australia gets the tauter 'Euro' suspension tune which brings with it some abrupt ride qualities. But the damper and spring rates are well sorted, in turn keeping body movement predictable. The hydraulic steering is light, as suits the Cerato's primarily urban role, but the weighting, crucially, doesn't go all weird and wacky when pressure is applied. Nor does rack rattle and kickback become too excessive over bumps and potholes. Even the Kumho Solus tyres display gripping talent. Other aspects of the Cerato impress, they just aren't as unexpected. The new Theta II 2.0-litre four-cylinder is quiet and smooth, boasting power and torque figures a Corolla would die for. It even gets enthusiastic about its task, when the intake valve timing ramps up at 4000rpm. The five-speed manual's combined claim is 7.8L/100km, the four-speed auto just one tenth more. Korean interiors have been improving for a while in terms of design, materials and quality, and the Cerato hits two out of three nails on the head. The look is modern, clean and well-built, it's quiet to ride in and spacious both fore and aft for adults. The large 415 litre boot's size and shape is aided by the torsion beam's compact design. The let-downs inside are predictably hard surfaces. It's one of the sacrifices of hitting a cutting edge pricepoint, another is the obvious lack of noise deadening material under-floor on gravel roads. Yet the base model Cerato S is a true bargain at $18,990 considering it comes with six airbags, ABS with EBD, active front headrests, and air con. ESP and cruise form a $1000 package option. The top-spec $22,990 SLi adds 17-inch alloys, front foglights, climate control, as well as cruise and ESP. The auto adds a further $2000. Away from the main stage Schreyer and his cohorts at Kia have done fine work developing an unexpectedly convincing car. So far, nothing better has come from Korea. Can Kia’s spicy Cerato GT live up to the ProCeed GT?